One of our younger readers, Rebekah Collins, has been doing research on the impact of 1080 on living organisms. She wrote the piece below as a Comment, but we felt it needed more exposure, so with her permission, here it is as an article. 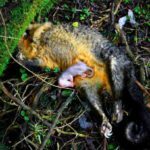 I feel that Susan Boyde is a part of a group of people misguiding the public over the damage that 1080 poison does to any living organism that consumes it, whether by primary or secondary methods. Sodium monofluroacetate is a chemical molecule that binds to proteins necessary for the metabolic processes in all living beings. The result of this chemical binding is the halting of the Kreb’s Cycle, a metabolic cycle that when stopped, will result in death of the organism. This induces a long and painful process in the organism that involves loss of muscle control, digestive function and in the last stages, cessation of cardiac and pulmonary functions. Contrary to seemingly popular belief of 1080 poison supporters, this process is not short, and it is most certainly not painless. During my study of this subject for my socio-economic report, I was tasked with finding scientific papers to back up my personal opinion as well as look at the other side of the argument. From my experience, it was significantly easier to find scientific documentation, that had been peer reviewed (as was a requirement of our paper), that supported the belief that 1080 is destructive to all living organisms, not just the pests that are the supposed target. It would appear, to me at least, that Susan Boyde is simply repeating the same argument with slightly different details that organisations like DoC have been saying for years. 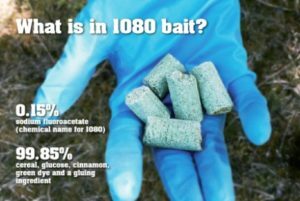 I believe that the very fact that a component of 1080 bait is bird seed, speaks very clearly for itself. It doesn’t take a genius to come to the conclusion that birds are attracted to bird seed and therefore make the leap in logic that 1080 is a threat to bird life when bird seed is a component of bait containing a deadly poison with no antidote. Wonderful to see an objective mind in action. Please never lose your voice….. its very important for everybody. The real problem is a political problem and that is the thought of how “to be seen” to saving the world on a limited budget. Problem is they make a lot of noise about a single subject and ignore what else they impact as politically they feel it does not matter. The impact on insects and the environment long term just seems to get ignored when proponents of 1080 explain why they need it…. and that usually around the need to save the Kiwi and like or eliminate TB and save a cattle industry. In actual fact Kiwi and the like can be saved much better through well constructed breeding programs and TB is not a real problem of the wilderness or the commercial world. Rebekah Collins what a breath of fresh air you are. You are a free thinker and have the intelligence to ascertain the real facts on 1080 and have not listened to those DOC spin doctors that infiltrate our primary schools to in”doc”trinate the innocent minds of our children! DOc are communists are they not? This is how communism works by continually adjusting the minds of the population that a certain mindset is the norm “all predators should die” is their main aim etc. Please teach you children to look at both sides of the stories they are taught and give instances so they may learn for themselves.